Why won't my photo upload? We accept the following file types: .jpg or .png. If your file is not in one of these formats, you'll want to convert it using a photo-editing software or free file conversion website. (Check out our File Specifications for more info on file type and size). Our site can process photo files between 1-35 MB. (Learn how to check your file size and type here.) If your image is any larger than 35 MB, you’ll need to re-save it at a smaller size prior to uploading. If your file type and size match the requirements above, try refreshing your page or trying the upload from another web browser. Some adblockers can interfere with uploads; try temporarily disabling or switching off your adblockers and then uploading again. When uploading from a mobile device or tablet, make sure Private Browsing mode is turned off on your device. Private Browsing will sometimes prevent a photo from uploading correctly. (Check out this article to walk you through switching off Private Browsing). 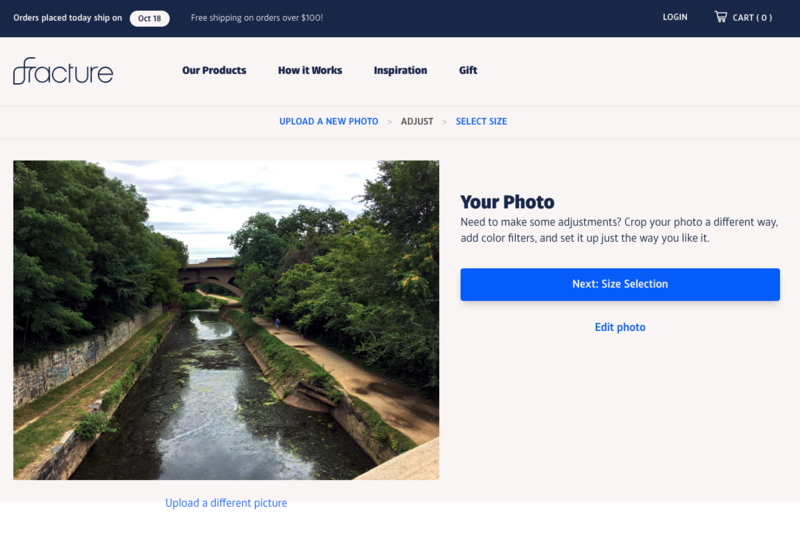 If you need help placing your order after your photo is uploaded, this guide will walk you through how to complete your order from there! Can I upload a photo from iPhoto or the Mac Photos App? What browsers are best compatible with fracture.me?